Let’s face it – rust happens. Whether it’s equipment that has been exposed to the elements over time or a repair job that someone brings into your shop with frozen, corroded parts. Chains, gears, pipe thread connections, screws, nuts and bolts and all types of metal tools – any of these can build up rust and other deposits from age, misuse or neglect. You need to be able to remove stuck parts to complete a replacement or repair fast. But what is the best way to free rusty nuts and bolts efficiently? The first thing you might try is a wrench or other tool to see if the part will come loose on its own. Once it’s clear that it’s good and stuck, the heavier equipment comes out. Drilling, hammering, chiseling or torching to loosen a frozen part can work, but this process is time-consuming and can require a lot more effort. You don’t want to break the part, your equipment, or injure yourself trying to get it free with tools and elbow grease alone. Instead, it’s generally more efficient to use one of the many penetrants and lubricants available that are designed to get into the narrow spaces between threads to loosen stuck parts. Penetrating oil is a necessity for any mechanic’s toolbox, and most already have a trusted go-to that they have been using for years. Gasoila’s Free-All penetrating oil spray has been trusted by mechanics for over 40 years to get the job done fast. Unlike other penetrating oils where most of the loosening action comes from lubricants, Free-All is formulated with a special rust-eating agent that actually removes the layers of rust, carbon, lead and other deposits. This has made it the “secret weapon” of mechanics and other professionals who know that Free-All works instantly to free frozen parts. Free-All’s three ingredient formula works fast – first, a highly mobile “seeking agent” delivers the lubricant faster and more thoroughly than most solvents, which results in more lubricant being administered before the solvent evaporates. Free-All also contains more lubricant by volume than their competitors, giving more loosening action to the frozen part. The rust-eating ingredient is a highly refined, naturally occurring substance that also creates its own lubricating film, preventing evaporation before the job is done. 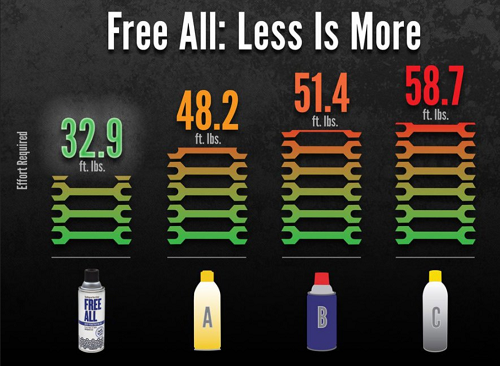 Independent studies have proven that Free-All is more efficient and powerful at removing rust when compared to similar products. It requires an average of 30 percent fewer foot-pounds of effort to loosen a part after application of Free-All than with competing penetrating oils. To use Free-All, simply spray the oil liberally onto the affected area and allow a few minutes for thorough penetration before manipulating or disassembling the part. Free-All will continue to protect against rust and can be re-applied if needed. Rust happens, but it doesn’t have to be a struggle. When a job needs to get done and rusted parts stop you in your tracks, saving time and effort matters. Make Free-All an essential part of your toolbox and be ready for your next rusted part challenge.